Trevor Noah won over a suburban Westchester, NY audience that had never heard of him before. He enchanted them with his clean-cut looks, a plummy accent and tales from an Africa they had never imagined. 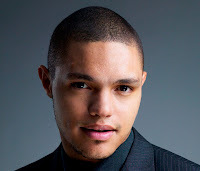 Trevor began by using much of his foundation material from his debut on the Jay Leno show: his mixed parenthood and his illegal status growing up under apartheid. His mother liked white men and his father being Swiss, you know, liked chocolate and in public he was like a bag of weed no wanted to own. This is a magic formula sold them on a personality they had never met before – an African they could relate to and a kind of comedic bridge between Barack Obama and Nelson Mandela. For the rest of the hour, except for a misstep at the end, he had the audience in the palm of his hand. The material peaked when Trevor talked about Oprah’s Girls School in Johannesburg. Here is someone every American knows and a story she has made very public. But Americans have never heard what people in South African think of her or the school. The story about Oprah’s expectations vs the African teachers she hired was hilarious. She told them not to spank the girls and they agreed. What any South African knows is that teachers back there don’t spank – they whip or beat. Ah, the old days…..! The flow began to ebb after Trevor's bit about the fly on the starving Africans in the UNICEF commercials. Even though it was funny it went on a bit too long, especially since many African American comics have taken a crack at this one. Trevor’s spin may have been the best but it is where the performance began to lose a little of its edge. Considering our guilt-ridden attitudes and the amount of time he spent with this he was obliged to go somewhere with story. After all, this is just the kind of audiences that responds to those ads and as far we know, people really are starving in Africa so where do you go with this? The funniest line I have heard in this vein is about the care package charitable Indians might send to Americans after a disaster that included something like canned vindaloo curry, frozen briyani, dried chillies and ghee with an emergency Sari wrap. He might have had fun with something similar - say a commercial imploring Africans to send their mopane worms to Americans devastated by a hurricane! Without a good segue, he closed his essential theme which is biracial African comes to America to “become black.” Since he was never really accepted by blacks or whites in South Africa, when he hears that in America he would definitely be considered black, he has to come over. Better yet, there is a new formula: you actually succeed by “going for the black” with Tiger Woods and the ultimate winner, Barack Obama, another biracial African, who are now considered black and no longer biracial. That is a great vantage point to make a lot of jokes about blacks, whites and their misperceptions and sorry relationship with Africa and themselves. South Africans who know his Nelson Mandela sendups or his impersonations of South African premier Jacob Zuma’s attempts to Facebook his supporters, his refusal to pay back the IMF or Julius Malembe’s cries of “that’s racist!” may be disappointed that none of this appeared in American guise. Could these be adapted for an American audience? We’ll never know. But after the fly joke the story line petered out and what emerged was the Trevor-the-linguist jokes. This line of amusing jokes about misspellings and American’s unusual uses of words and pronunciations are an amusing subtheme and significant part of his "African in the land of non-African blacks" jokes. The funniest are his “knowadimean” and perhaps event the transformation of the Ku Klux Klan to a more truthful Ku Fascist Club or KFC - which may have killed more black people than the KKK ever did! However, once it separated from that context, it lost its thematic resonance. Since the show ended with Trevor talking about his knowledge of Japanese and the amusing interaction with a Japanese speaker at an airport it lost some of its oomph. He is a great impressionist, a gifted and seasoned performer and all his pieces are marvelously enacted but once he strayed from his theme the big laughs declined and the show closed on a relatively lower note. What he really needed was to build on his cross-cultural misperception schtick in order to close on a crescendo. Nevertheless, this show will be edited down for TV - apparently a Comedy Central special - and presumably, his management will craft the final product to fit the audience expectations. For South Africans, however, there is a lot to be learned here. Trevor made South Africa seem incredibly interesting and, with deft management, he could be a major crossover performer – a big star and an ambassador for a new Africa. (And yes, anyone who know the scuttlebutt realizes that controversies will be sure to follow.) As for the audience, they were a sociologist’s goldmine of unexpected juxtapositions: a comibination of older local suburbanites who were comped because they are theater members or their guests. They had no idea what to expect and were pleasantly surprised. Others, mostly white South Africans, made the trip to the ‘burbs paid the modest $15 door charge to support a star from the old country. Finally, there was a back-up group of “fans” mostly African Americans who filled the unreserved seats and roared with appreciation. The net result was a happy audience and a very interesting puzzle in terms of how Trevor, Africa, race relations, diverse expectations and even political affiliations come together over a single performer. By any chance do you know where to get a copy of this taping? I've looked everywhere, even wrote to Noah's website and Comedy Central to no avail. I would like to use it for a university lecture. Any help would be greatly appreciated. Hi there! I simply want to offer you a huge thumbs up for your great information you have right here.I will be coming back to your site for more soon.